Jose Principe and his research group have explored using models of the brain to extend computation and signal processing. This activity uses the brain to inspire computing and algorithms, as well as working with systems to understand how the brain operates. Principe’s research – neural information processing – is a multidisciplinary area at the frontiers of adaptive filter theory, machine learning and theoretical neuroscience. 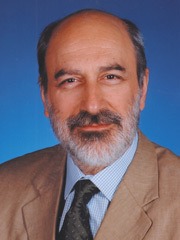 In 1991 he established the Computational NeuroEngineering Laboratory (CNEL) which has gained international fame for developing a set of innovations, including the gamma neural model and the information theoretic learning, which is advancing our understanding of neural networks and machine learning for signal processing. Since joining UF in 1987, Principe has secured more than $14 million in research funding as either principal investigator or co-principal investigator, including more than $5 million during the last five years. He has been continuously funded since 1993 by the National Science Foundation’s NeuroEngineering Program. From 2002 to 2007, the CNEL participated in a $20 million multi-university, multi-disciplinary team funded by the Defense Advanced Research Projects Agency to develop brain-machine interfaces. During this time, Principe also collaborated with the UF McKnight Brain Institute in a bioengineering partnership for brain dynamics in epilepsy, and is one of the core directors of the UF NIH Center for Study of Emotions and Attention. Since 2002 he has been granted three U.S. patents and filed 10 other disclosures that are being evaluated by the patent office. He was the founder and vice president for research of NeuroDimension, Inc., from 1993 to 2005, and has been a regular consultant to Convergent Engineering, both located in Gainesville. Principe is a Fellow of the Institute of Electrical and Electronic Engineering (IEEE) and of the American Institute for Medicine and Biomedical Engineering. He received the Gabor Award from the International Neural Network Society in 2006 and the IEEE EMB Society Career Achievement Award in 2007.